This delightful one-act musical was inspired by Paulo Coelho’s international bestseller The Alchemist, which in turn is based on an age-old folk tale about a peddler who dreams of a treasure waiting for him in a far-off land. 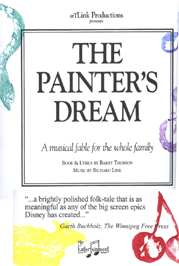 The Painter’s Dream is a coming-of-age story about a young artist who has lost his colours. His dream of a far-off treasure sends him on a wild journey across the desert where he encounters life in all its vicissitudes. Distractions in the form of love and money threaten to forestall him on his adventure, until a wise old father provides some insight into navigating life’s journey. Our young hero comes face to face with the darkness—both inside and outside of himself—and must decide between affirming his choices or throwing it all away for safety. One of the songs, Teachings of the Father is included on Richard’s CD Committed to my Heart. Copyright © 1994-2008 Richard Link and Barry Thorson.